Welcome to the third Episode of Michael Maloney’s Hidden Secrets of Money. Mike was asked to speak at an event in Singapore and to give his opinion on the future for the U.S. Dollar. His presentation was titled ‘Death Of The Dollar Standard’ and showed very clearly that the Dollar Standard is developing serious cracks, and will likely split at the seams during this decade. How will this affect you? It’s not all doom and gloom, as you’ll learn from watching the video above. If you have any questions or comments, please leave them below… and don’t forget to check out Mike’s update to this episode (in your Info Toolkit) once you are done. The journey continues, this time Mike takes you to Greece to learn when, where and why currency became money. You’ll also learn one of the most predictable long-term economic cycles – the Seven Stages Of Empire. Then join Mike at a private meeting in London where he lets you connect the dots of the seven stages across the last 140 years of our own monetary history. Mike Maloney takes you to Egypt to unravel the difference between currency and money. This is one of the most important lessons you will ever learn, and will pave the way for your understanding of future episodes. Because without knowing exactly what money is… how on earth can we expect to learn about it? If you are one of the few people left in this world, that believe the Clinton’s are honorable people, and that the world or at least the US would benefit from another Clinton presidency, you should either read the “Clinton Cash” book written by Peter Schweizer or watch the documentary based on his book. Please, share this blog post / video with anybody you care about in the USA… or the whole world as this does not just affect those in the US. Let me know your thoughts about it in the comments below. If you have heard Obama’s New Year address this year, you might have thought that the US economy is doing great. As you can see, most people (ever) have been helped the economy in January 2000, and right now we are at the almost lowest point since January 2010. Now, you might say… maybe, “Maybe more people work these days for the government?”, you might be right… but what does that mean? If these days more people work for the government, that means more tax money from those working to improve the economy (the civilian labor force) will be used to pay for those that don’t help the economy (government). 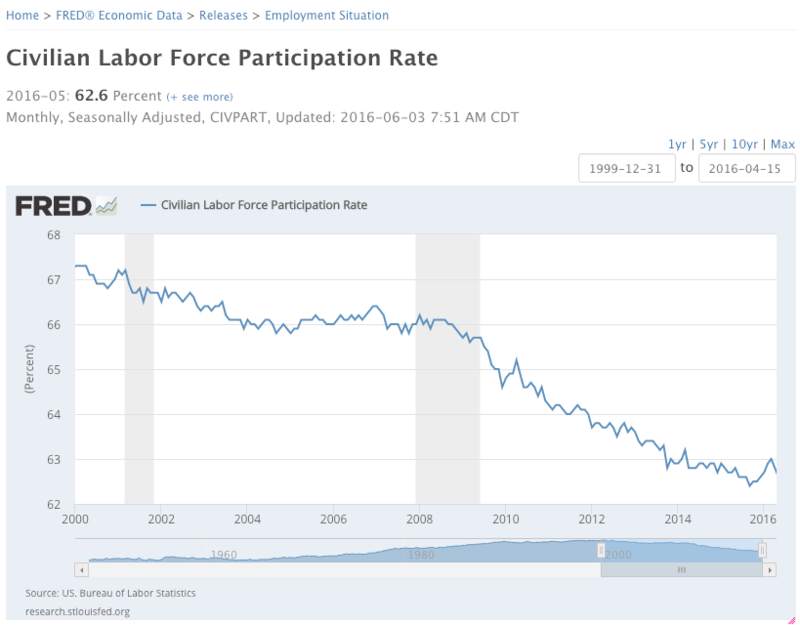 So, a decrease in the civilian labor force is bad for the economy, an increase in the governmental labor force is also bad. Both together is a disaster! For more info on the Brexit topic that Mike mentions in this video, click here. The Brexit information if of major importance for anybody that can vote in the UK. BTW… for those of you in Australia that want to help reduce the size and expense of the goverment that just burns resources and doesn’t help improve the economy, I invite to check out the Liberal Democrats at LDP.org.au.